I am using a lot more marinades since I found some healthy alternatives to the usual stuff out there. Hilary’s Eat Well Apple Fennel Dressing/Marinade helped make my chicken breast dinner a masterpiece last night! This dressing only uses real ingredients and it is free from common allergens. I love that this line of products uses only wholesome, organic ingredients. Today I am going to talk mainly about the chicken dinner I created but I will also discuss a salad that I created with this dressing as well. It is a great, versatile ingredient for your next meal. I marinated the chicken breast in the Apple Fennel Marinade for a few hours so I could infuse my chicken with this flavor. It might even work better to marinate the chicken overnight. I used my Lodge Cast Iron Grill Pan to cook the chicken breast. I also added some sliced red apples to the pan to grill them up too. For a side dish I had broccoli and shallots roasting in the oven. Instead of using olive oil, which I normally use, I tried out the Primal Kitchen Extra Virgin Avocado Oil. Great choice there because this broccoli turned out delish. This dish turned out absolutely wonderful. Even though it is still summer I am getting a hankering for fall flavors. A couple nights ago I made a turkey chili. I am so ready for fall! This dressing is gluten-free, soy-free, dairy-free, egg-free, corn-free, and nut-free. So if you are trying to avoid allergens this is a great product for you. The main ingredient in this dressing is apple cider vinegar, which had many health benefits! It also uses extra virgin olive oil, sunflower oil, dandelion root, fennel, and a few other natural ingredients. There are no unusual, unpronounceable ingredients on the label. When I see a label with weird ingredients I try my best to avoid them. I love that this product keeps it real! This dressing can best be described as sweet and tangy. The tanginess is from the apple cider vinegar. I don’t often use anything with fennel in it but I really enjoyed it in this dressing. I do have a jar of fennel in my spice cabinet and I did sprinkle some extra fennel on the chicken breast. Not only does this marinade make a great dinner but it makes an incredible salad dressing as shown below. I created a tasty grilled chicken salad with baby spring mix, sliced Honeycrisp apples, walnuts. This salad was truly bursting with fall flavors. Check out Hilary’s Eat Well products on their website and come back over here and let me know what you will try! There are many dressings/marinades available and also veggie burgers! YUMMO! 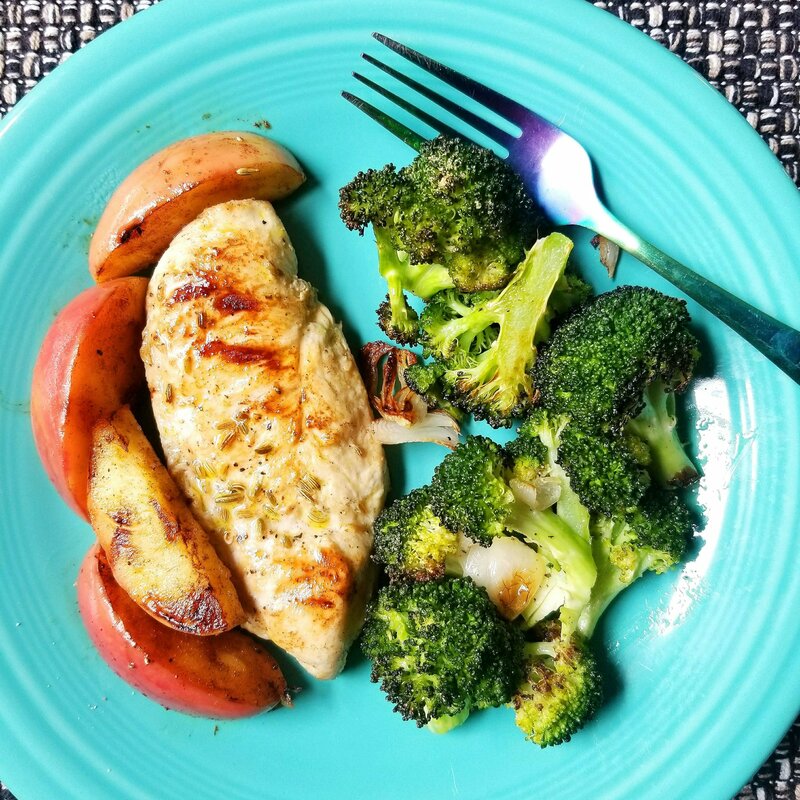 This entry was posted in My Cooking Journey, Product Reviews and tagged apple fennel dressing, chicken breast, chicken salad, healthy dinner, hilary's dressing, hilary's eat well, organic, paleo, real food. Bookmark the permalink.